TangT, Targan SR, Li Z-S, Xu C, Byers VS, Sandborn WJ. Randomised clinical trial:herbal extract HMPL-004 in active ulcerative colitis – a double-blindcomparison with sustained release mesalazine. Aliment Pharmacol Ther. 2011;33(2):194-202. Ulcerative colitis (UC) is a chronic inflammatory disease of the colon. About 50% ofpatients with UC are treated with drugs that contain 5-aminosalicylic acid,including oral and rectal mesalazine, sulfasalazine, balsalazide, andolsalazine. Those for whom these drugs do not work are treated with steroids,azathioprine, or the anti-tumor necrosis factor-alpha (anti-TNF-α) agentinfliximab. Risks for infection and malignancy have been associated with thesetherapies. 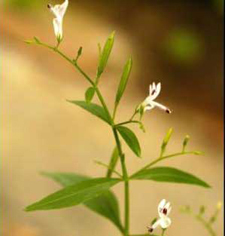 Andrographis (Andrographispaniculata;AP) is widely used inAsian countries to treat various inflammatory and infectious diseases. Theauthors sought to determine if HMPL-004 (Hutchison Medipharma Ltd.; Shanghai,China), an aqueous ethanolic extract of AP, could significantly decrease theactivity of UC and produce significant mucosal healing. The8-week study, which included 120 patients, was conducted at 5 sites in Shanghai, China,between November 2005 and November 2006. Eligible patients were aged 18 to 65years, with a diagnosis of mildly to moderately active UC confirmed bycolonoscopy within 1 week of the beginning of the study. Baselineevaluation included disease history, physical examination, complete blood count(CBC), serum chemistry, urinalysis, and C-reactive protein (CRP) test forinflammation. CBC was repeated at 4 and 8 weeks; routine laboratory assessmentsand physical examination, at 8 weeks. Clinical symptoms were assessed atbaseline and every 2 weeks by using the Chinese GastroenterologicalAssociation's (CGA's) 2001 Standard for Diagnosis of UC Symptom Score Paradigm.Mucosal healing was evaluated by colonoscopy, and histopathology was evaluatedby biopsy at baseline and at 8 weeks. Sixtypatients were randomized to receive HMPL-004, 400 mg 3 times daily; the other60 patients received mesalazine SR granules (Etiasa®; Ethypharm Industries; France), 1500 mg 3 timesdaily. The 2 HMPL-004 lots used in this study contained 8-10% andrographolide (AG)by weight. Allanalyses were conducted in the intention-to-treat (ITT) population—thosepatients who took 1 or more doses of study medication (53 in the HMPL-004 groupand 55 in the mesalazine group). Consequently, patients with no treatmentoutcome due to discontinuation of the study were considered to have shown noefficacy. Althoughno other UC medications were allowed during the study, about 50% of patients ineach group had been on mesalazine at some time before the study. About half ofthose had failed to respond satisfactorily to it on at least one occasion. Apost hoc analysis revealed that 70% of patients who responded to treatment(with remission and partial remission) in both groups had not receivedmesalazine previously. Regardingsafety, the authors report that 7 (13%) patients in the HMPL-004 group and 15(27%) patients in the mesalazine group had at least 1 adverse event. Most ofthose events were mild to moderate and probably not related to the studymedication, according to the authors. Atweek 8, 11 (21%) patients treated with HMPL-004 and 9 (16%) patients treatedwith mesalazine were in remission. An additional cohort of 36% in both groupswas classified as being in partial remission. Overall efficacy (remission,partial remission, or improvement) was reported in 40 (76%) patients in theHMPL-004 group and 45 (82%) patients in the mesalazine group (P<0.001). Also,at week 8, results of the colonoscopy evaluation revealed 28% remission and 74%response rates in patients treated with HMPL-004, and 24% remission and 71%response rates in those treated with mesalazine. Ofthe patients with available biopsies at week 8, 53% in the HMPL-004 group and40% in the mesalazine group had decreased inflammation of at least 25%. Ofthose patients with CRP concentrations above the upper limit of normal atbaseline, 80% in the HMPL-004 group and 66% in the mesalazine group had CRPconcentrations within normal limits at week 8. Theauthors conclude that both drugs significantly improved the clinical severityof UC and eliminated inflammation assessed by colonoscopy in about 25% ofpatients. The distribution between the percentage of patients who experiencedremission, partial remission, or improvement was not different between the twogroups. The limited sample size, however, did not power the study todemonstrate non-inferiority. Nevertheless, these results suggest that HMPL-004could be used as a substitute for induction therapy with mesalazine or be usedas induction therapy in patients who have a suboptimal response to mesalazine.